Yes, a dietitian will tell you that in moderation even fried foods can fit into a healthy diet. Visit Hungry Happenings for the story, ingredients and recipe. Thanks for sharing my Football Fritters with your readers. you're quite welcome. Thank "you" for sharing your recipe and photo with us. 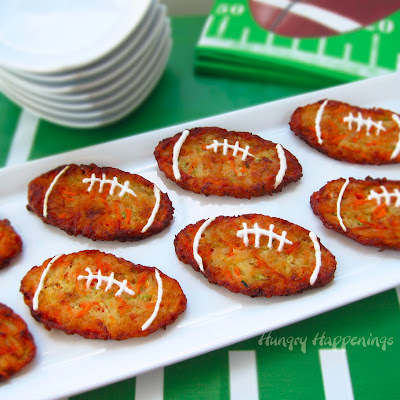 I think your football-shaped veggie fritters are quite creative and fun. Enjoy the game later!